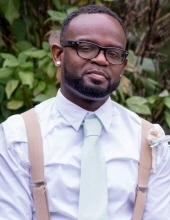 Alfonso “Allen” Bailey III, 34, a resident of Harwood Heights, IL, passed away peacefully at his home on March 21, 2019. He was born in Biloxi, MS on September 9, 1984, to the parents of Ollivette Samuels and Alfonso Bailey Jr. Growing up as a child, Allen was quiet and shy but enjoyed making people laugh. At an early age, he joined Main Street Missionary Baptist Church under the late Dr. Kenneth Haynes Sr., where he was very active in the youth ministries, such as the drill team and youth choir. Allen relocated with family to Jackson, Michigan where he graduated from Jackson High School in 2003. Upon graduation, he began a 15-year career with Foot Locker Inc. This allowed Allen to travel to many cities in Michigan, Ohio, and Illinois as a Manager Trainer and Manager. Some of his achievements include Sales Leadership Award from 2008-2015, Coaches Award, Manager of the Year, Top Percent Gain, and #1 Dollar Per Transaction Award. During his career, Allen’s love for shoes flourished. Allen loved Michael Jordan, was a huge LSU fan and favored LeBron James. Allen enjoyed bringing a smile to people’s faces and offering an encouraging word when needed to family, friends, and even strangers. All who knew him will miss his sense of humor, smile, and genuine caring spirit. Allen was greeted in heaven by his grandparents, Lillian and Johnny Alexander, along with his father Alfonso Bailey Jr. He leaves to cherish fond memories with his mother, Ollivette Samuels, Biloxi, MS; brothers: Quintinez Alexander, Dallas TX; Laquan (Jillian) Bailey, Atlanta GA; Aaron (Desiree) Bailey, Manitowoc, Wisconsin; Nehemiah Long and Zephaniah Alexander both of Biloxi MS; sisters: Ebony (Jerome) Easter, Fort Bragg NC; Laquanda (Trey) Wiggins-Bailey, Virginia Beach ,VA; Amirah (Mike) Franzen Bailey, Sheboygan, Wisconsin; Nataya Bailey of Orange Park, FL; 22 nieces and nephews; a host of aunts, uncles, cousins and friends. Family and friends are invited to attend his Celebration of Life service on Saturday, March 30, 2019, at 12:00 noon at Main Street Baptist Church, 321 Main St, Biloxi, MS 39530. Visitation will be held from 10:00 AM until service time. To send flowers or a remembrance gift to the family of Alfonso Bailey III, please visit our Tribute Store. "Email Address" would like to share the life celebration of Alfonso Bailey III. Click on the "link" to go to share a favorite memory or leave a condolence message for the family.